Dru are top of the range, cast iron stoves, made in Norway. Dru stoves seem to me a little better than their direct rivals, just compare the weights of the stoves for a start: the Dru stoves tend to be heavier because they are very solidly built. A Dru stove is built to last for many, many years - that much is clear when you have a good look at how they are made and put together. 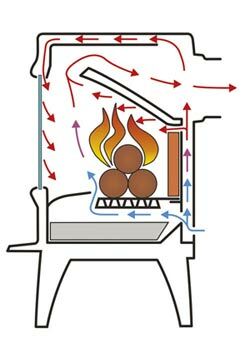 Dru stoves feature primary, preheated secondary and tertiary air supplies, incorporating airwash of course. Each stove comes as a dedicated woodburner (apart from the 44 which is a multi fuel stove), but there is the option of a multifuel model. The two larger stoves, the Dru 64 and Dru 78, both have side opening doors which means loading those longer logs is easy. The multifuel versions also have a top loading door which you can use in conjunction with a fuel hopper (for serious coal burning), and a thermostatic control which automatically maintains the desired heat output. All the Dru stoves come in a painted anthracite finish as standard, but there was the option of two coloured enamelled finishes too. The majolica brown is being discontinued, there are a few still in stock. Of particular note, the ivory white enamel looks very good. The handle to operate the main and side doors of the Dru stoves is very nicely finished in stainless steel and is fully removable. This not only keeps the handle cool to the touch but helps to ensure that the stove door cannot be opened by mistake. The stoves are excellently packaged and transported with a light wooden frame built around the stove. When you receive your Dru stove please bear in mind their weight: the 64 and 78 especially are very heavy, and you will need to plan ahead for when your stove arrives. The Dru 44 is a 4.9kW stove well suited to the smaller room of to provide some secondary heating. The 44 is a multifuel stove made from cast iron. A new addition to the Dru range. The Dru 55 has an nominal heat output of 8kw, making well suited to a medium sized room. The Dru 55 comes comes in two models, a woodburning stove or a multifuel stove. The Dru 64 CB is a woodburning stove suited to the medium sized room. Intelligent air supply to the Dru 64 firebox means that the wood will burn efficiently and the glass stay clear of deposits – provided your wood is seasoned of course. An impressive and elegantly designed stove, the Dru 78 CB is a dedicated cleanburning woodburner, suited to the larger room. The Dru 78 CB can take logs of up to 600mm (over half a meter! ), and has a side loading door as well as the front door.